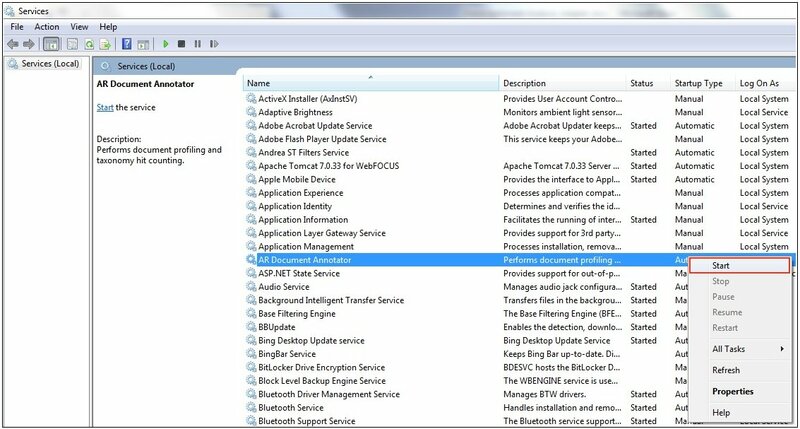 This section describes how to install, configure, and update the WAND Taxonomy Server. The WAND Taxonomy Server requires a Microsoft Windows 2008 Server environment or higher. Save this backup copy to a different directory outside of the C:\Program Files (x86)\Applied Relevance directory structure (for example, C:\temp). 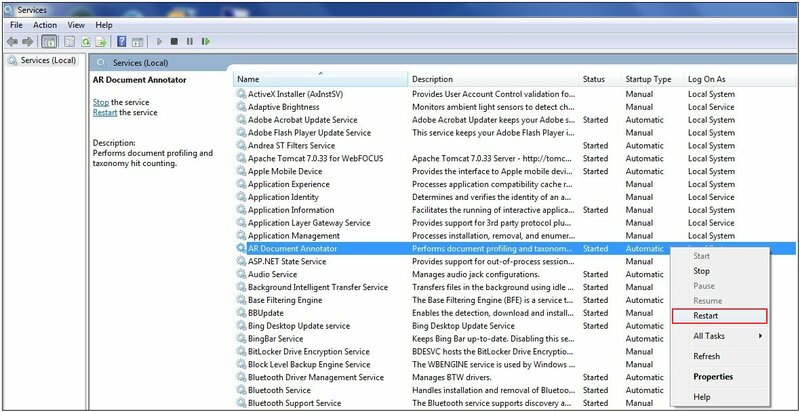 Uninstall Document Annotator Service from the Control Panel, as shown in the following image. Obtain the WAND Taxonomy Server software. 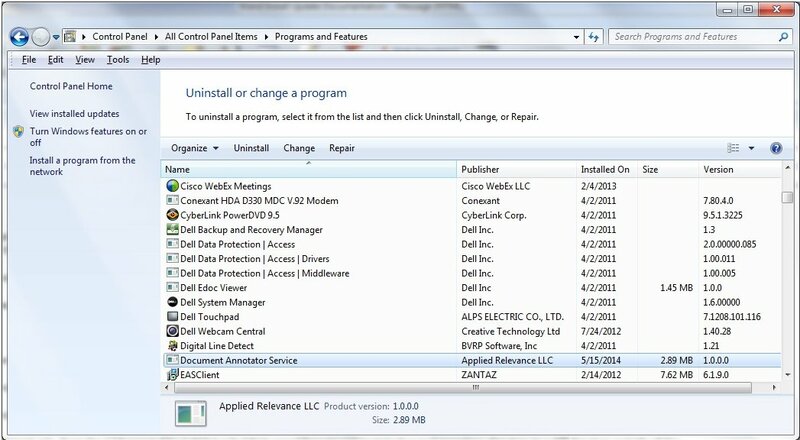 If necessary, unzip the installation software to a temporary directory on your file system (for example, C:\Wand). Search for the cmd.exe file from the Start menu and run it as an Administrator, as shown in the following image. 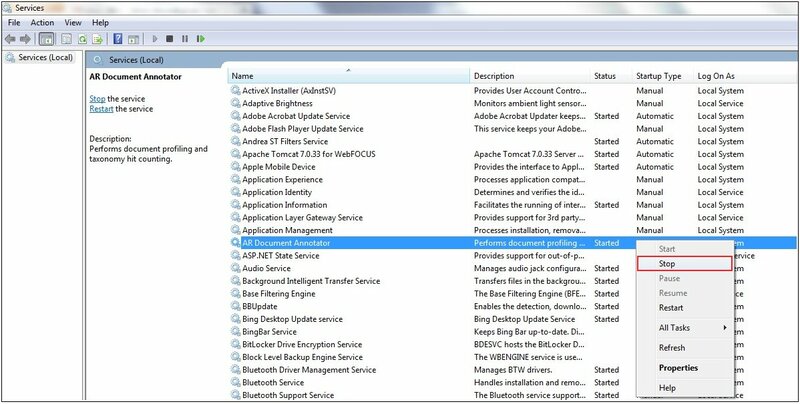 Navigate to the directory that contains the Wand Taxonomy Server installation software. Type the .msi file name for the Wand Taxonomy Server installation. The Document Annotator Service Setup dialog box opens, as shown in the following image. 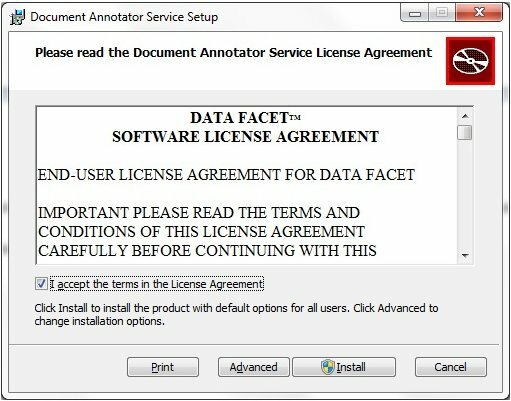 Select I accept the terms in the License Agreement and then click Install. 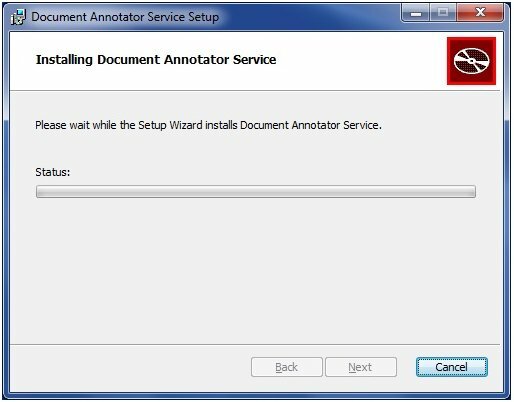 The Setup Wizard installs the Document Annotator Service, as shown in the following image. When the installation of the Document Annotator Service is complete, click Finish, as shown in the following image. Note: If the version of the WAND Taxonomy Server software installed is an update to a previous version, then follow the instructions in How to Update the WAND Sentiment Taxonomy. You must update the installed Sentiment taxonomy with the Sentiment taxonomy that was backed up in Step 1. The WAND Taxonomy Server must be configured so that the host name for the Taxonomy Server installation is either the machine name or IP address. Edit the AR.DocumentAnnotator.exe.config file using a text editor. If required, modify the value in the <baseAddress> element so that the host name is the machine name or IP address where the WAND Taxonomy Server is installed. Save the changes made in the AR.DocumentAnnotator.exe.config file. 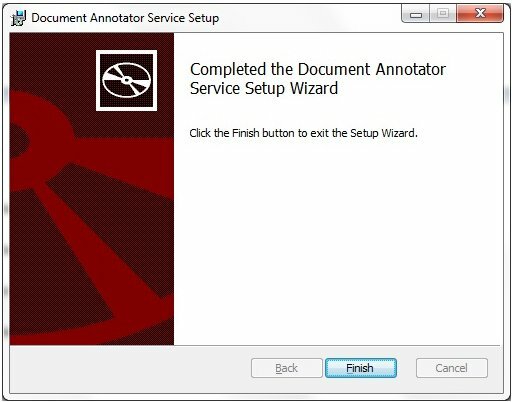 Open the Services utility on Windows through the Control Panel and restart the AR Document Annotator service, as shown in the following image. The Sentiment.artx file, which is located in the C:\Program Files (x86)\Applied Relevance\DocumentAnnotatorService\repository directory contains the Sentiment Taxonomy used for scoring textual data. As a Sentiment Taxonomy update or a localized Sentiment Taxonomy in a different language is made available, the Sentiment.artx file must be replaced with the updated version. 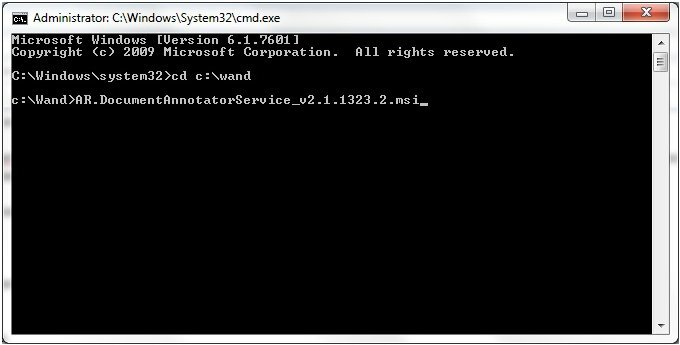 Open the Services utility on Windows through the Control Panel and stop the AR Document Annotator service, as shown in the following image. The following example shows the installation of a French Sentiment Taxonomy. Rename the updated Sentiment Taxonomy so that the file name is Sentiment.artx, as shown in the following image. Open the Services utility on Windows through the Control Panel and start the AR Document Annotator service, as shown in the following image.